Harbourside Market was formerly known as Waitangi Park Market and Chaffers Market. 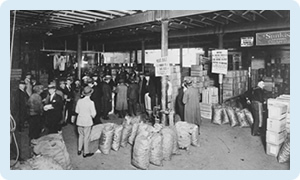 Fruit and vegetable markets have been a huge influence in this part of Wellington for over 100 years. The Waitangi name dates from when the area next to the current basin reserve was a shallow lake which suffered from flooding. After a series of earthquakes and subsequent drainage and reclamation of land around this part of Wellington’s coast, its potential as a good trading place grew in response to proximity to the city’s ports and the Te Aro railway station. 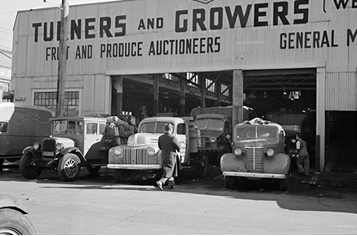 Well before Harbourside Market began operating, much of the produce commerce was centred around Blair and Allen Streets, just off Courtenay Place, where wholesalers and growers came to trade in the warehouse buildings which still remain today. Blair Street was home to the Wellington Fruit and Produce Exchange which formed a central hub of the Wellington Produce Market. 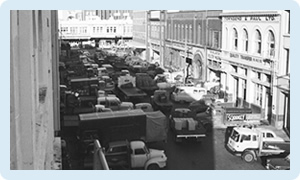 The warehouse buildings were accessed from street level, which allowed vehicles to enter and offload produce directly onto the market trading floor. 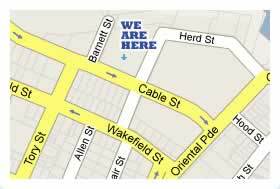 Proximity to the Te Aro railway station as well as the port was also conducive to the market trading in this location. In particular, the southern extension of the rail network from the Lambton Station to the Te Aro station shortened the length of time it took for fresh produce to arrive into the city. A notable date in the area’s history was a massive fire on 26 November 1928 – the fire was so big it was fought from both Blair Street and Allen Street and caused extensive damage, and many buildings required to be re-built. 1942’s earthquake also had a profound effect on the area – several buildings in the area were demolished in response to a building programme; however, Allen and Blair Streets were redeveloped – many of the buildings escaped being demolished and now form an area of bars and restaurants in the original market buildings. The market has operated in its current location since August 2002, where every Sunday up to 25,000 people attend the market. The market is now widely known as Harbourside Market and has been in is current layout since 2011.